I was struggling with this post’s title. How on Earth am I supposed to make the subject of this post condensed from: “Chicken, lightly breaded and seasoned, then cooked in white wine, lemon, butter, vegetable stock. 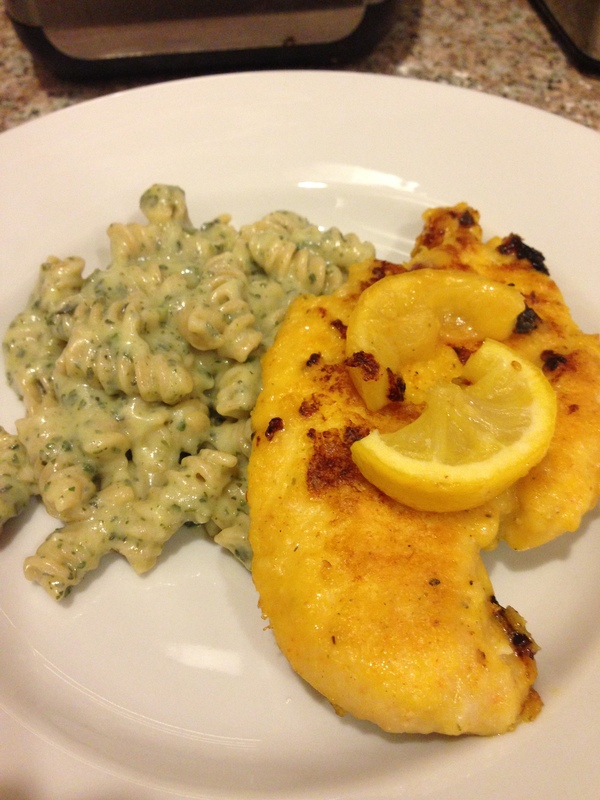 Oh, and a side of creamy pesto whole wheat pasta” – yeah, I don’t think that would fit. Due to the extreme popularity of this dish’s deliciousness, I think the title I decided to go with is pretty fitting. It was so delicious that Sean went back for more…but even more impressive…he never once went for the hot sauce, salt, or pepper to add it in! HUGE SUCCESS! He loves hot sauce, so he does that. But not for this recipe! It must come from heaven. First step is to put a bunch of flour in a large bowl. You don’t need to measure out the amount I listed above. That was just to give you an idea of how much you need to have handy. It just needs to be enough to coat the chicken slices. But before you do, add to the flour: cayenne pepper, salt, pepper, and garlic powder (enough to your liking, and to give the coating a good kick). In a separate bowl, mix up about 3 egg yolks. This will keep the flour mixture on enough for a good “lightly battered” taste. Dip the chicken in the flour first, then into the egg yolk, then back into the flour for a good strong coating of flour. Set those battered chicken slices aside and begin preparing the broth to cook it in. I always love this part. 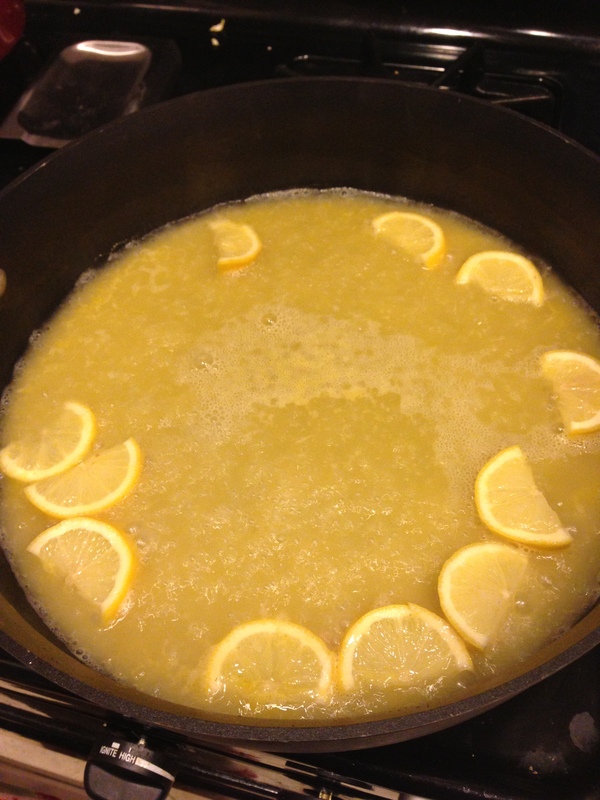 The part when the smells in my kitchen completely come alive with lemon and white wine in a mouthwatering broth. Hehe! So exciting. Mmmmmm smells so good! While that simmers, let’s talk wine, shall we? I love wine. Adore it. I’m not a snob, I promise, but I do love tasty wine. Lately my new favorite red is called Apothic Red. Have you tried it? You can check it out here: http://www.apothic.com/wine.asp. Do you have a favorite wine? Please comment and let me know! I’m always excited to try new wines. Well this was a fun chat while the broth simmers. “Apothic Red” ~ a new favorite! …hehe…now this wine is making me giggle. P.S. Don’t forget to share your favorite wines with me!